forget to use everyday resulting in cracked, sore hands. As much as I love the results of a thick, creamy hand cream I tend to use them only at night. Most are really rich so when using them in the day it just becomes a hassle as they take ages to sink in. 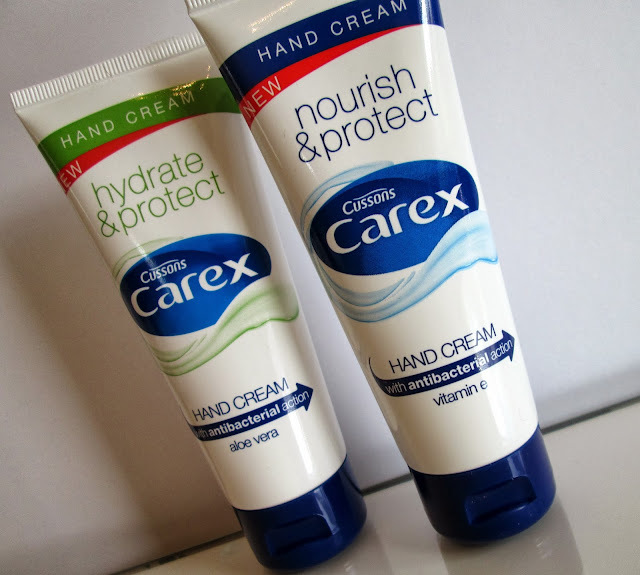 With this in mind I was excited to try out Carex's latest offerings in the form of light weight hand cream to see if they could help combat cracked, flaky hands. Hydrate And Protect is my favourite of the two creams. It's light weight and reminds me a lot of a face serum as it's water based and sinks in almost immediately. It has a clean, light Aloe Vera scent that's not too intrusive and provides an quick hit of moisture that has a cooling and soothing effect on the skin. Nourish & Protect is a lot more, well, nourishing than the Hydrate and Protect. It's also water based so still very light but has a slightly thicker consistency and really works well at softening your hands with the help of Vitamin E. Both creams have antibacterial action which adds a great bonus as they keep germs at bay as well as protecting your skin. I love these hand creams! Thanks for review!